Dover Publishing has sent me a copy of Alice Starmore's book Tudor Roses to review. My initial reaction is WOW! I was sent the soft cover version. It has fourteen patterns and is described as "the reimagined edition of the groundbreaking classic". The original book was published in 1998. I don't have a copy of that book for comparison but I have read online that some patterns are brand new and some are altered versions from the original book. This book has stunning, moody, art photography all done by Jade Starmore (Alice's daughter). Jade also contributed four of her own designs to the book. You can check out her own website here, where she has examples of her work in photography, illustration, fashion styling and textile design. 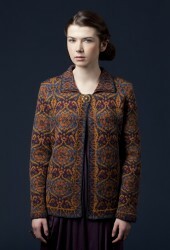 All of the designs are inspired by women of the Tudor dynasty which includes the wives of Henry VIII. If you enjoy history you will like reading the written pieces accompanying each design which were penned by the design inspirations themselves. Each will give you insights into the lives of these famous women. At the back of the book Alice and Jade included a section which describes how they used each women and the history they knew to create their designs. It's really more than a knitting book in the way it has been presented. If you love the more arty end of the fashion world the book will definitely appeal to you. I suspect some knitters will find the photos to be a little over the top. Some are shot against very dark backgrounds which makes them beautiful but the garments can be a little hard to see at times. Fortunately each pattern includes several photos. 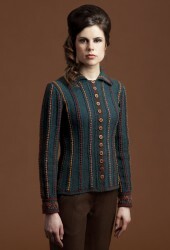 The garments themselves range from amazing Fair Isles to solid coloured textural pieces. They are generally fitted and many have set in sleeves. I'm very taken with Margaret Beaufort and the stunning detail which has gone into this design in the shot below. Dover has been kind enough to allow me to donate a copy to my knitting guild for their raffle. The proceeds are then donated to charity.